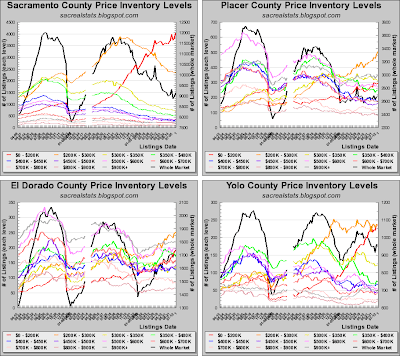 Inventory increased for the second week in a row, while Sacramento County asking price trends seem to have broken decisively to the downside for the first time in 2008. 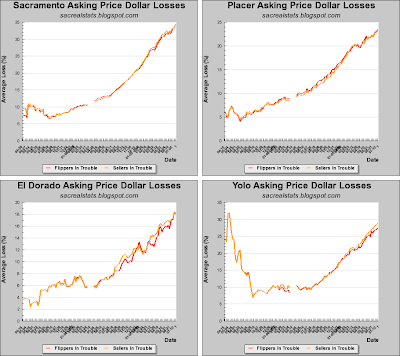 Market stress indicators continued to show deterioration at a somewhat increasing pace. 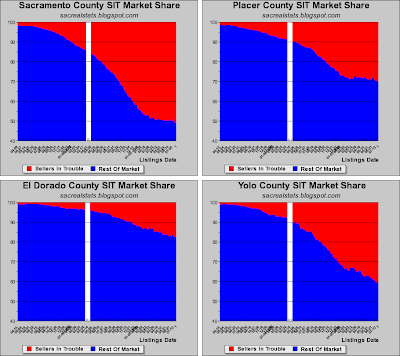 The average SIT asking price loss in Sacramento County is now 34%! I'm willing at this point to declare the spring dead cat bounce completely over, and I see no reason why the market won't deteriorate further in the next six months. The weekly median asking price drop of $5,750 on June 28th, 2008 was second only to the $6,000 drop on October 20th, 2007 for the largest price drop in several years. This weeks drop of $4,990 was in the top 10. 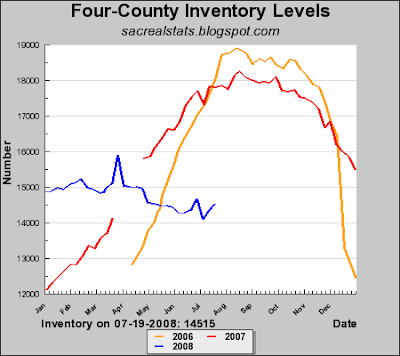 Since I started keeping detailed records in April 2006, the median asking price in Sacramento County has fallen from $379,000 to $225,000. That's a decline of 40.6%. At the current rate of decline, the median asking price will fall below $200,000 by the end of September. HURRY HURRY HURRY!!! URGENT MESSAGE! Buy now before the price drops futher! This message has been sponsored and approved by id10ts. AKA knife cathers. I heard from a reliable realtor that wells fargo is about to drop 12,000 homes on the tri-couty area of Sac.,Placer, and El Dorado. 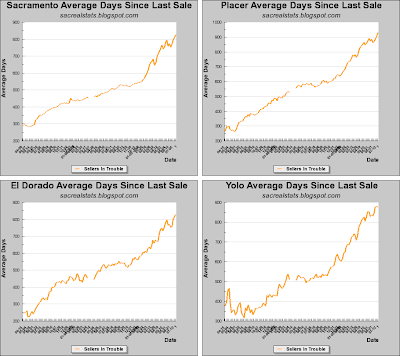 There was so much that went pending in Jan/Feb that never closed and is just sitting off the market. Little by little they trickle back on and sit some more. After hearing my friends problems with securing financing, basically their purchase limit was halved in 6 mos., I think there will be more sitting for a long time. It takes a while for the realities of credit tightening and higher rates to filter through to lower prices. After hearing my friends problems with securing financing, basically their purchase limit was halved in 6 mos. 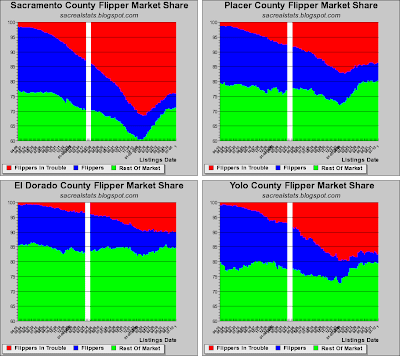 There is absolutely no second-loan market right now. None, nanda, zilch. 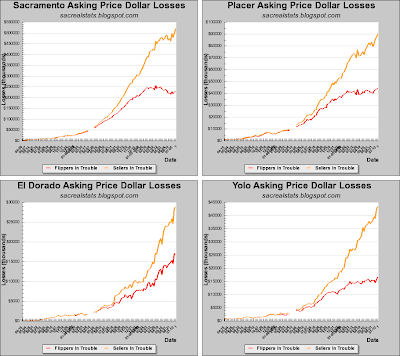 CalPERS will do a 90% loan only, and 80% is now the norm for Sacramento. So how long before the asset managers realize they have to drop prices even more if buyers have to come up with 10% or better? DJ, the average time on market for an REO dropped below 40 days... I think they have it under control. 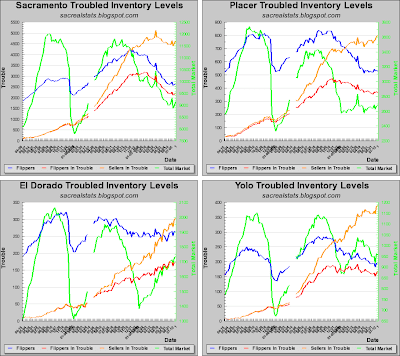 My guess is inventory was up 2 weeks running due to FNMAE news and normal July slowdown in sales.... but sales (closings) thru June have been way up YOY. 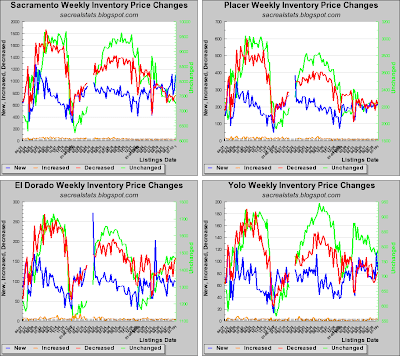 Inventory is down 18% YOY and you're excited about a little statistical noise? Lets look at the details - did somebody drop a few hundred REOs on the market or just a bank of condos? Wouldn't even bother counting a short sale listings or pendings as they rarely close (about 10-15%), 60+ days to get responses, etc. They're next year's REOs. 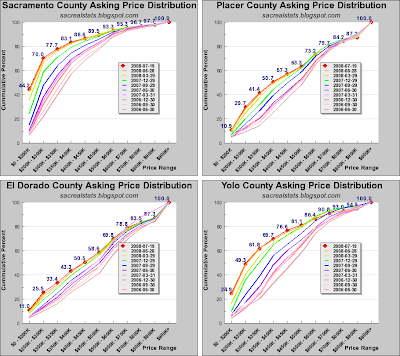 My guess on "asking" price drops is it is now happening on the higher end, making a larger impact on the median. I agree that w-o-w changes aren't trend defining, but it seems like it's all going to script. 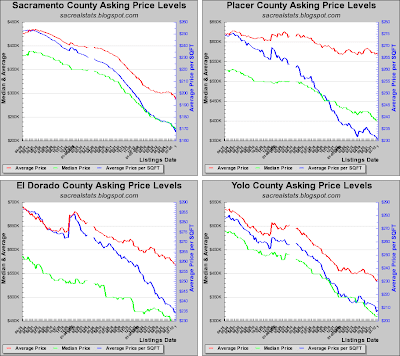 For the last few years, asking prices have increased (or stopped decreasing) in the spring, and fallen the rest of the year. 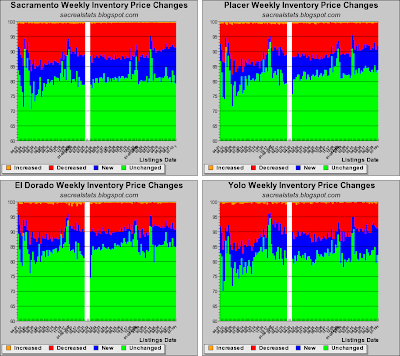 Yes, the inventory curve is unusual, but pricing is true to form. Maybe by next spring we'll know for sure! FNM news? My man, this is a historic meltdown of the GSE's and the primary backstop of the RE market is imploding. This is hardly "news" - that is a gross mis-characterization of the situation. What do you think will happen to RE prices when TRUE default risk is appropriately priced into mortgage rates? 12%? 15% interest rates? Bizarre, bizarre. Another house sold in my neighborhood. Been on the block for awhile, six months or so. 2br/1ba listed for $385K. I know it couldn't have sold for that. I thought doctors (most of the new homeowners are doctors) were knife wielders, not knife catchers.